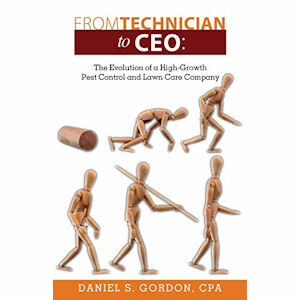 CLEVELAND—Dan Gordon, CPA, a PMP columnist and owner of industry accounting consultancy PCO Bookkeepers, has written a new book. From Technician to CEO: The Evolution of a High-Growth Pest Control and Lawn Care Company tells the fictional tale of Peter Hall, a second-generation pest control operator (PCO) and lawn care professional (LCP) who grew up amid his family business, went off to college to earn a business degree, and returned home to work in, and eventually take over, the family business. While growing up, Peter watched his father work diligently to make a modest living for his family. While attending business school, Peter studied several facets of business, including management, accounting, finance, marketing and operations. His professors used the case method to teach, using successful high-growth, highly profitable companies as subjects. After learning about the strategies employed to expand these model companies, Peter believed he was in a position to move his family’s pest and lawn business on a high-growth trajectory. But what tools would he need to make this happen? Do the lessons he learned in the classroom translate to a realistic strategy that can be used to grow a company that will dominate the market, creating above-average income and providing long-term wealth for his family? While the characters are fictional, the time-tested business concepts are real — and serve as a roadmap to success for the owner or manager of a pest management or lawn care company. The book is available online at www.amazon.com/dp/0985858923.